It’s here! Game 1 of the 2019 WHL playoffs have arrived for the Vancouver Giants. Tonight at the LEC they’ll welcome the Seattle Thunderbirds to town to kick off the second ever WHL post-season meeting between the two clubs. The Giants enter tonight’s game winners of eight of their past 10 heading into the playoffs while the Thunderbirds won seven of their past 10. The two clubs split their season series during the regular season each winning twice. With 49 career playoff games under his belt, no player in this entire first-round series has played more WHL playoff hockey than Thunderbirds captain Nolan Volcan. The 1998-born forward from Edmonton, AB has been to the WHL playoffs in each of his four seasons in the WHL. In two of those four seasons, Seattle appeared in the WHL final, falling in 2016 to Brandon before winning 2017 against Regina. In 49 playoff games Volcan has scored nine goals along with 12 assists for 21 points. Over the course of his WHL career, Volcan has appeared in 321 career regular season games. This season he scored 27 goals to go along with 30 points for 57 points in 58 games. In four games against the Giants this season, Volcan has scored twice and has added two assists for four points. He was originally selected by the T-Birds 27th overall in the 2013 WHL Bantam Draft. 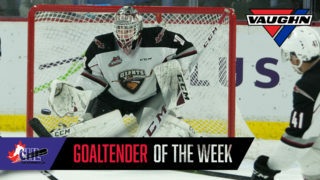 Since joining the Seattle Thunderbirds on January 1st, goaltender Roddy Ross has gone on a terrific run of success. The 2000-born goaltender from Meadow Lake has appeared in 25 games for the T-Birds and has posted a record of 16-5-1-2. His goals-against-average was 2.76 and his save percentage was .919. His only regular season appearance against the Giants though did not go very well as he was pulled after surrendering five goals against in just over 40 minutes of work. 1999-born forward Matthew Wedman set all sorts of new career highs during his fourth full WHL season. The product of Edmonton, AB led all Thunderbirds with 40 goals and 77 points. His 2019-19 season marked a 30-point improvement from a season ago. Wedman also took the second most faceoffs in the entire WHL (1643). He led all Seattle skaters with three goals against the Giants in 2018-19. No member of the Vancouver Giants has appeared in more playoff games than 1999-born forward Jadon Joseph. The pride of Sherwood Park, AB has appeared in 36 playoff games over the past two seasons. In each of his first two seasons in the WHL, Joseph reached the Eastern Conference Finals as a member of the Lethbridge Hurricanes. Joseph has fit in seamlessly with the Giants since he arrived to the team after a January trade with the Regina Pats. In 32 games with the Giants Joseph has managed 10 goals and 18 assists for 28 points. He finished the season with a career high 22 goals and 53 points. Joseph scored the final goal of the 2018-19 regular season for the G-Men on March 15th in Kelowna giving him 100 career regular season points. He heads into the playoffs having notched six goals and eight assists for 14 points in his past 11 regular season games. Earlier this week Bowen Byram was named a first team WHL Western Conference All-Star. In his second full WHL season Bowen Byram finished with 26 goals and 45 assists for 71 points in 67 games. 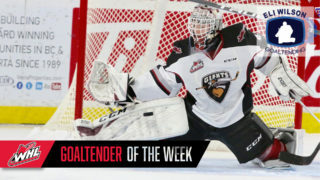 His 26 goals marked a new single-season high for goals by a Giants defenceman and his 71 points put him second on the team in outright scoring and third in league scoring among all WHL blueliners. Byram’s milestones didn’t stop there. Six of Byram’s 26 goals this season were overtime winners – A new single-season WHL record. 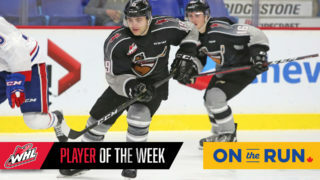 Last week Byram received four team awards including: The Sultan Thiara Plus-Minus Award (+33), the 3-Stars Award, the Pat Quinn Defenceman of the Year Award and the P.C. Toigo Most Valuable Player Award. In 138 career WHL games with the Giants Byram has posted 32 goals and 66 assists for 98 points. Lukas Svejkovsky led all Giants in goals against Seattle with three. The Giants were 11-8-1-0 against the US Division during the regular season. The Giants power play has scored at least once in 15 of their past 17 regular season games. During that span the power play has gone 21/59 (35.5%). 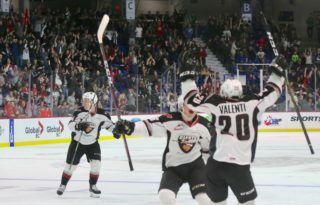 This marks the second time in a span of 18 years that the Giants and T-Birds have met in the WHL playoffs. Back in 2007 the Giants defeated the Thunderbirds in five games in a Round 2 Series.